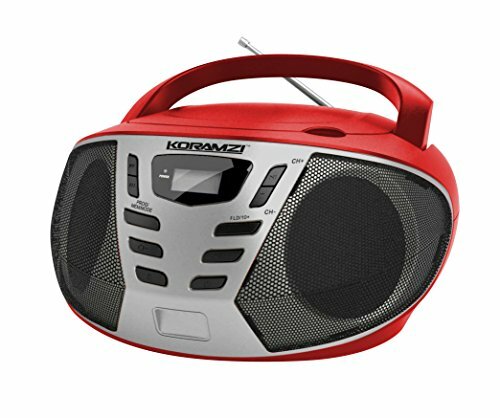 Koramzi CD55-RDS Portable CD Boombox Full Range Stereo Sound System has top loading CD player . This system can playback all digital audio CD, finalized digital audio CD-Recordable (CD-R) discs, finalized digital audio CD-Rewritable (CD-RW) discs and CD-DA format digital audio CD/CD-R/CD-RW discs. Programming tracks of disc are possible when playback is stopped. Up to 20 tracks for CD disc can be stored in the memory in any order. You can play one track or all tracks on the disc repeatedly. For private listening, insert a 3.5mm headphone (not included) into the HEADPHONE jack. Telescopic Antenna, LCD Display (without backlight), Programmable up to 20 memory tracks in any order. If you have any questions about this product by Koramzi, contact us by completing and submitting the form below. If you are looking for a specif part number, please include it with your message. Minnie Mouse Voice Change Boombox With Microphone! Sing Along To Built In Music Or Connect Your Own Device! Minnie Bowtique Voice Change MP3 Boombox for Girls Who Love To Sing! © 2019 - thecomputerwiki.com. All Rights Reserved.